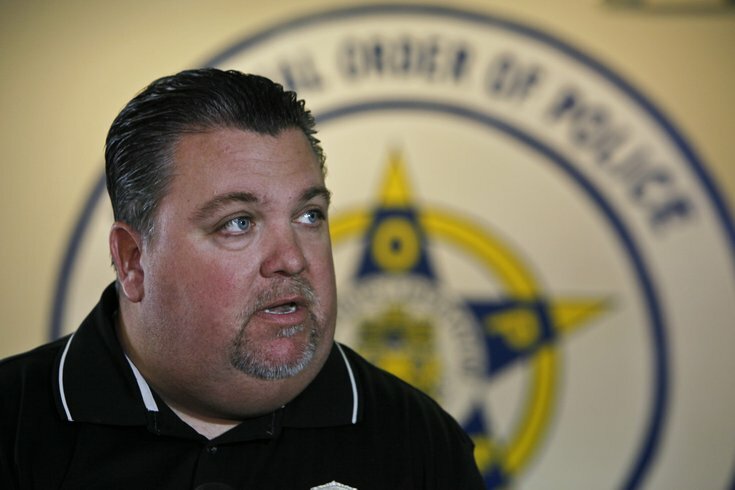 Fraternal Order of Police Lodge 5 President John McNesby, seen in this file photo responding to questions from the news media on Oct. 1, 2012 at F.O.P. headquarters in Philadelphia. A Philadelphia judge has upheld a city policy that calls for the release of police officers names who are involved in shootings within three days of those incidents occurring, despite the Fraternal Order of Police Lodge 5's attempt to end the practice. Common Pleas Court Judge Daniel Anders denied a challenge from the FOP on Friday. The police union believes the policy poses a risk to officers and their families while the judge maintained that releasing officers' names is best for the city and its residents, Newsworks reported. Asa Khalif, a Black Lives Matter activist, stressed the importance of accountability during a phone interview Saturday morning and said he views Friday's decision as a victory. "It's extremely important, especially in black and brown neighborhoods where police violence is currently [happening on] an everyday basis ... that police remain transparent," he said. The FOP said they will continue to fight against the policy in a statement released Friday. "The standard for obtaining an injunction is high, and the judge felt that based upon the evidence available – namely the lack of actual harm to any of the police officers whose names have already been released in accordance with the policy – the standards for relief was not met," the FOP said in the statement. "Nevertheless, the fight is not over." The FOP has a pending unfair labor practice charge filed with the Pennsylvania Labor Relations Board and expects a hearing examiner to make a decision on the issue early next year. Khalif doesn't believe the FOP will succeed in its mission. "I don't expect any victory on that front, as well," he said. "This is an era of transparency." The Philadelphia Police Department announced it would release the names of cops involved in shootings within a 72-hour time period in 2015. The issue was brought back to light last month when protesters gathered outside of the home of Officer Ryan Pownall in Bustleton to speak out against the shooting and death of 30-year-old David Jones. The small group of activists, led by Khalif, posted "wanted" flyers on telephone polls near Pownall's house, which was being heavily guarded by officers. City officials told CBS3 that the policy makes sure that the officer is safe prior to the release of his or her name to the public. “We don’t want a Ferguson, a Chicago, Baltimore, or St. Louis," City Solicitor Sozi Pedro Tulante told the news station. "Part of that comes from the sense that the police department is being transparent."